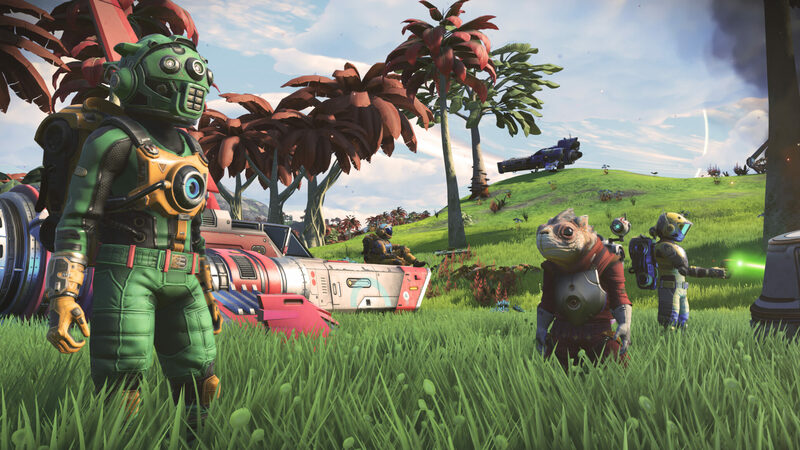 No Man’s Sky is hitting a highly anticipated milestone in three days with the NEXT update, due to enable proper multiplayer at long last. In an interview with Eurogamer, Sean Murray looked back at the launch and said he is still proud of the game that was shipped in 2016 despite all of its shortcomings and the customer complaints. He also maintained that the vision for No Man’s Sky wasn’t changed, it just got bigger and deeper with all the free updates released by Hello Games. Obviously it could never have been that at launch, is the first thing. If we’d have waited to have launched until now… I was going through the feedback on all the updates we’ve done. The major features are things we’ve always wanted to add. But a lot of the stuff is coming from the community. We’re listening to them – not in a touchy-feely way, in a pure stats way. How do we solve this problem they’re having – that’s our methodology, and has been since launch. That’s our way of focussing ourselves and deciding what to do. The thing I’d say is that at launch we were this weird game where you could be lonely, it was very science fiction. But to me, I am so proud of that game. So proud of the team. They managed to pull it off, and it really did hit the notes that we wanted to hit. On an emotional level, it hit those emotions. The people who did get – when we’re reading those reviews from people like Time, The Guardian – Eurogamer!- it was hitting the notes that we’d set out five years ago to do. When we announced, and first showed it at VGX. The thing that people thought – a game where you could have a whole universe and land on a planet and it’ll have trees and rocks and creatures, that’s impossible. Everyone was like ‘it’s vapourware’. But that’s what we delivered, we delivered on that. […] But you could see how you can expand it, and it can still be true to that. When you see a group of four playing, it still feels sci-fi, it still feels lonely because there’s this whole planet and you’re this tiny little dot. It’s still space, it’s still the frontier. The vision hasn’t changed – it’s just gotten bigger and deeper. I was super happy with the way we delivered on that vision at the start. But there was bags of potential that you could see. You looked at it and thought okay you could play this for 20-30 hours, then you’ll move on to the next thing. And you’re like ‘this could be so much more!’ So I understand why people saw it and thought ‘this’d be amazing with multiplayer! Why haven’t they done that! No Man’s Sky NEXT will be available for free for existing PC and PlayStation 4 owners. On Xbox One, it will be included with the game, priced at $49.99 with 4K and HDR support.